With 4 shelves and a separate clothes hanging rail, this wardrobe is the ideal addition to any family camping trip, perfect for storing clothes and shoes. Complete with handy side pockets for additional storage, this wardrobe has a generous capacity and is perfect for decluttering your space within your tent or awning. 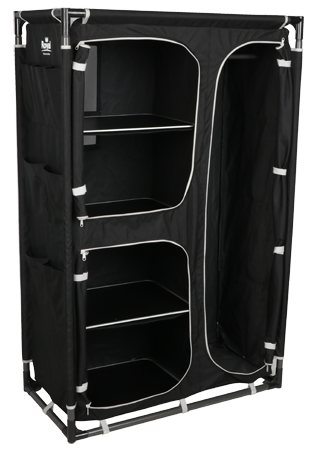 Supplied with a carry bag, and folding into a much smaller size, the wardrobe is built for convenience and ease of transportation.